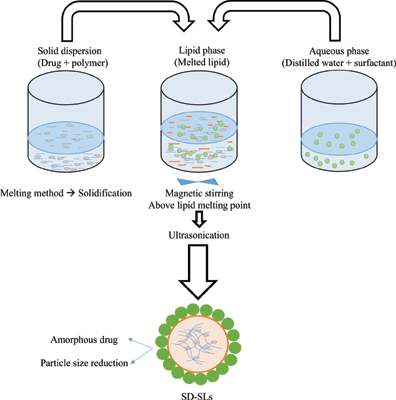 Background: The aim of this research was to engineer solid dispersion lipid particles (SDSLs) in which a solid dispersion (SD) was encapsulated to form the core of solid lipid particles (SLs), thereby achieving an efficient enhancement in the dissolution of a poorly water-soluble drug. Methods: Ultrasonication was introduced into the process to obtain micro/nanoscale SLs. The mechanism of dissolution enhancement was investigated by analysing the crystalline structure, molecular interactions, and particle size of the formulations. Results: The drug release from the SD-SLs was significantly greater than that from the SD or SLs alone. This enhancement in drug release was dependent on the preparation method and the drug-topolymer ratio of the SD. With an appropriate amount of polymer in the SD, the solidification method had the potential to alter the drug crystallinity to an amorphous state, resulting in particle uniformity and molecular interactions in the SD-SLs. Conclusions: The proposed system provides a new strategy for enhancing the dissolution rate of poorly water-soluble drugs and further improving their bioavailability. Keywords: Crystallinity, dissolution enhancement, micro/nanoscale, solid dispersion, solid dispersion lipid particles, solid lipid particles. Keywords:Crystallinity, dissolution enhancement, micro/nanoscale, solid dispersion, solid dispersion lipid particles, solid lipid particles. Abstract:Background: The aim of this research was to engineer solid dispersion lipid particles (SDSLs) in which a solid dispersion (SD) was encapsulated to form the core of solid lipid particles (SLs), thereby achieving an efficient enhancement in the dissolution of a poorly water-soluble drug.